The publication of the first “Teaching Excellence Framework” (TEF) results provides a new source of information both for staff at universities to think about changes they might make to the way they teach, and for prospective students to compare places at which they are considering studying. This exercise involved the Government bringing together a whole series of statistics about student satisfaction levels, drop-out rates, employment rates at graduation, etc, to try to measure how effectively each institution is teaching. In addition, the institution gets to write a fairly short document providing commentary and context for the statistics, which is also assessed by an independent Government-appointed panel. Ultimately, it is intended that the score in this process will be used to determine the fees that universities can charge, but for now it is largely just an attempt to assess the quality of teaching across the country. The possible award levels in TEF are Bronze, Silver and Gold, and we are pleased to report that the University of Nottingham was one of the 26% of the 295 institutions taking part that was awarded the highest Gold standard. In the School of Physics & Astronomy, we very strongly take the view that teaching and research should be closely integrated. This integration is apparent directly through the summer research internships that students can do, the projects that they undertake in their higher years, and the specialized final-year MSci modules, but also in the more mainstream teaching in all years, where lecturing by staff currently undertaking world-leading research ensures that the syllabus stays right at the cutting edge of physics. It is therefore interesting to compare the results of TEF with those of its cousin the “Research Excellence Framework” (REF), a Government evaluation of UK university research in all subjects conducted every 6 or 7 years (last carried out in 2014). 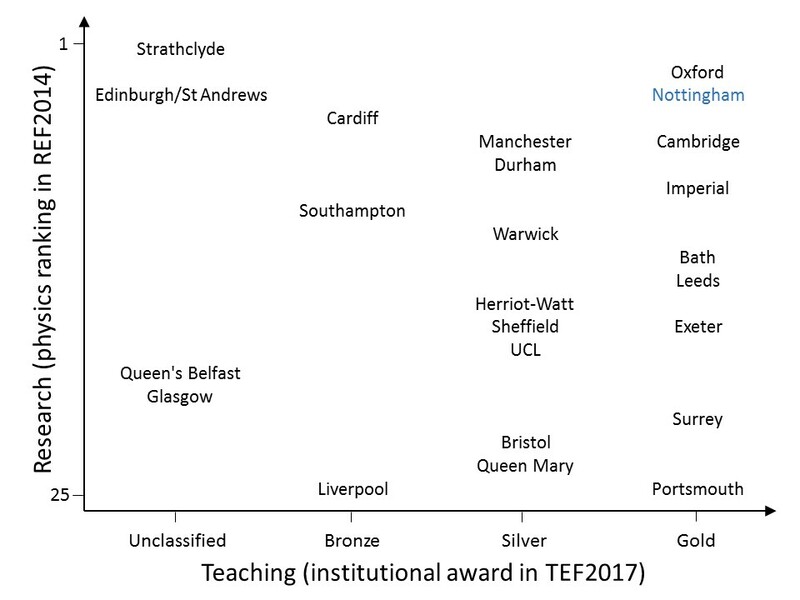 The figure below shows the ranking of physics departments across the country in the last REF plotted against their recent award in TEF. One thing that is clear from this figure is that there is a wide scatter of properties, with some institutions better at teaching while others score more highly for their research. It is important not to over-interpret the results of any assessment like TEF or REF as they always have their uncertainties and limitations – for example, many Scottish universities opted not to take part in this first TEF, so do not have an award. But if you are a prospective student looking for a university that is nationally recognized for both the quality of its physics and the quality of its teaching, then it is worth considering closely the institutions toward the top right of this plot, and we are proud that the University of Nottingham lies right in that region.